King Cohen: The Wild World of Filmmaker Larry Cohen is a deftly made documentary about the life and films of iconoclastic director Larry Cohen. Like Melvin Van Peebles before him, Larry Cohen is one of those artists for whom the rules don't apply. Sure, it would be great and illustrious to have the career of Christopher Nolan or a Stanley Kubrick. However, the career of Larry Cohen certainly looks to be a lot more fun and prolific. Getting his start in the Kraft Theater in the 1960s, Larry Cohen worked on a litany of shows like The Fugitive, The Defenders, Columbo and many others. However, it would be his work as a writer on a franchise like Maniac Cop, Phone Booth, It's Alive (another franchise! ), that would cement his legacy as the go-to guy for a different kind of cinema. One that could best be described as elevated exploitation. This obviously touches on his directing work on films like Black Caesar, Hell Up In Harlem, It's Alive, and The Stuff among others. Larry Cohen showed that he could work across multiple genres. Never allowing himself to be pigeonholed, never allowing himself to be defined by any one film, this probably accounts for Cohen's continued relevance today. This documentary follows the classic tropes we have come to know from this brand of film. We see Larry Cohen's rise up the film ranks as an opportunistic writer who eventually decided he needed to make his own films. Beginning with 1972's Bone, Cohen was intent on turning genre's on their heads. This continued throughout his career and actually seemed to to inform the production aspects of his movies. Whether he was writing, directing or writing, directing and producing, Cohen always seemed able to find an angle that was both commercial and interesting. Considering the homogenization of so much of the filmmaking world this is no small feat. Cohen always seemed to find a way to meet deadlines, got shots (often shooting in public without permits), and use his whimsical nature to get what he needed cinematically. At the same time, he was trying to say something within the exploitation genre that moviegoers could only find in a rare Roger Corman film. That both filmmakers worked with American International Pictures isn't surprising. 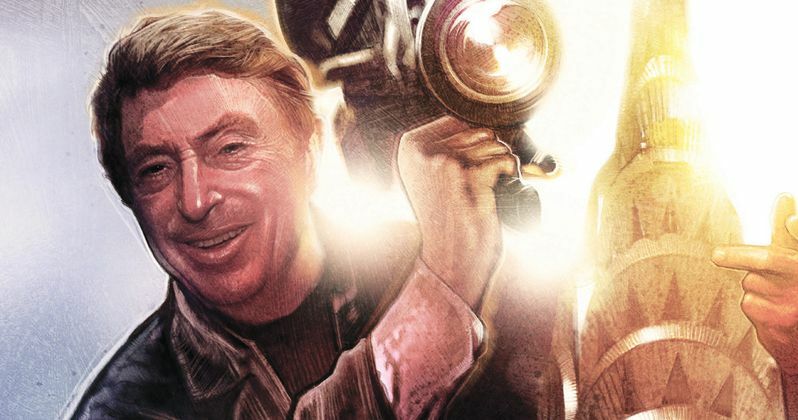 King Cohen: The Wild World of Filmmaker Larry Cohen is an in-depth layered look at what it means to live a creative life. Larry Cohen seemed destined to have a career that couldn't have gone any other way. He had to be free to tell his stories. At the same time, he understood the financial considerations of the film business. In many ways Larry Cohen in the most important kind of artist. Finding a way to put a personal stamp on "genre films," while also making things that the general public wishes to see. Director Steve Mitchell has filled King Cohen: The Wild World of Filmmaker Larry Cohen with tons of archival footage and interviews. We get to hear from the likes of J.J. Abrams, Rick Baker and Joe Dante among others. All this plays to perfection as this documentary isn't so much a love letter as a necessary piece of film history. One that reminds us that to create is the greatest gift we can give the world.